But it's only 3 pages. The good thing is you can read it for free online. Problem is just that it is really, really short. It's like with the Harry Potter prequel. Does it really add something? In my most humble opinion, it does not. This particularly short story deals with, you may have guessed from the title, Thomas's first memory of the Flare. For the few minutes it took me to read it, it kept me entertained. But overall I have kind of a mixed relationship with the whole series, as far as I've read (and seen it). I read (and discussed) the first book and was underwhelmed, but went to see the movie anyway and actually liked it quite a lot. So, I wanted to read the second book (which I did and also discussed) but which I again thought was 'mwah' at best. However, I then went to see the second movie which I hoped would be as nice as the first one and it was just really weird. I think it's one of the weirdest movie experiences I've had, since the movie was nothing like the book. As in, they changed the whole plot. And the ending. I was confused for at least 95% of the time. It was just so weird, I don't know how to explain. A friend of mine who didn't read the books said he enjoyed himself, so if anyone was planning to read the second book before watching the movie, perhaps watch the movie first. 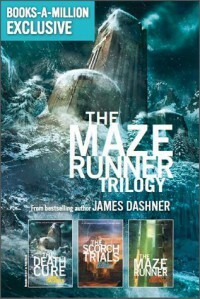 The Maze Runner series contains The Maze Runner, The Scorch Trials, The Death Cure and prequel The Kill Order. Thomas's First Memory of the Flare is a super short story set between the second and third book. Another prequel, The Fever Code, is planned for next year.